The Prism Sound ADA-8XR Frame is a rack-mountable 2 RU audio interface chassis designed to deliver versatile clocking and configurability for producers, musicians, and audio engineers in home, project, and commercial studios. Its modular design yields flexible I/O arrangements thanks to four I/O module slots—two analog and two digital. 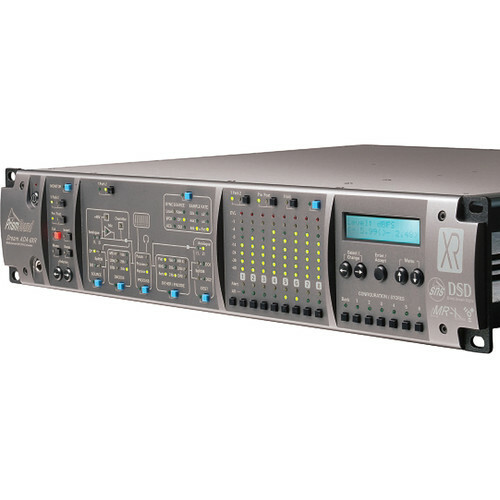 A variety of modules (available separately) can be installed for access to multichannel analog/digital inputs and outputs as well as Pro Tools or FireWire workstation connectivity. The ADA-8XR Frame supports resolutions up to 24-bit/192 kHz, and can clock internally or to external AES3, AES11, word clock, or Pro Tools Loop Sync. The built-in Utility Module provides stereo analog RCA and digital BNC audio outputs, BNC word clock and XLR AES11 sync I/O, and a DB9 serial communications port. Additionally, the front panel has a 1/4" stereo headphone output along with assignable 8-channel bargraph meters. An onboard display and comprehensive controls enable efficient adjustment of parameters, which can be quickly stored and recalled via factory and user presets. The ADA-8XR Frame comes with no I/O modules, ready for custom configurations.